We are open everyday at 10am – 10pm (11pm on Fridays & Saturdays during Summertime). Please the bottom of the page for current hours. Do you make your ice cream? Yes! 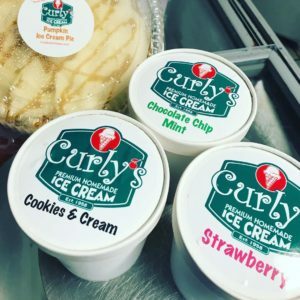 Curly’s has been around for 60 years now, making high quality homemade premium ingredient ice creams in our local Pompton Plains factory. 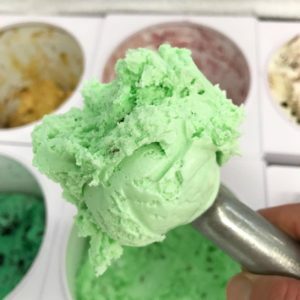 Traditional favorites like “Mint Chip” & “Cannoli Cream”, along with new flavors like “S’mores” and “Bananarama” are in regular rotation. We scoop over 40 flavors at our flagship Riverdale location. We are a “Safe Serve” facility. Do you have soft serve? Our soft serve is what put us on the map – people say it tastes like no one else’s. We start with a high quality, rich base and mix in the right calibration to give it creaminess. Sure, the yield is much lower, but the taste is soooo much better! Do you only do ice cream? Yes, and no…we offer old fashioned thick malted shakes, egg creams, birch beer floats, banana splits, and much more. We also have a great selection of “old school” frozen treats like ice cream sandwiches, chippies, tortonies, tartufos & ice creams for take-home enjoyment. What is the yogurt flavor? It’s rotated out daily – please give us a call (973-839-0198) if you’d like to know before you come down. Yes, we can do any amount $10.00 and up. Makes a great gift and they never expire. Sometimes? Often? 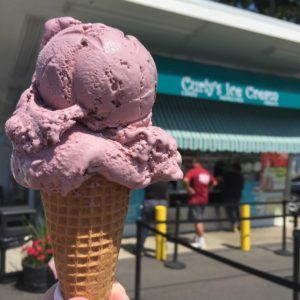 On those perfect Summer days, you may find a fast-moving line at Curly’s. We have three windows and some really great staff that keep things moving quickly. We have been told it’s well worth the wait! Do you have sugar-free options? Yes, we have sugar-free vanilla & chocolate ice cream. Do you have vegan/dairy free options? 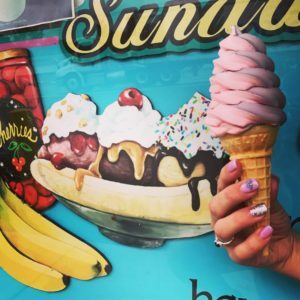 Yes – we have soft-serve sorbet that changes flavors daily (think “Green Apple” or “Berry Berry”) that are vegan/dairy free as well as our wide selection of homemade Italian Ices (such as “Strawberry Lemonade” & “Mango” – except for the chocolate, sorry). We do not. We’ve found that ice cream is best enjoyed right after its been made for you! Melted ice cream is not good. Is Curly’s hiring? How old do you have to be to work here? Yes, if you are local & available year round (not just for the Summers), please stop in or fill out our online application. In the state of New Jersey, you need to be 16 years old for employment. How much notice do you need for a special order cake? Ideally, 48 hours but sometimes we can do 24 hours. Please see our online ordering page for more info. Please note we also have a HUGE variety of sizes already made up at the store for purchase. We are always happy to customize it for you on the spot for you. Yes, we do. Please email us at catering@curlysicecream.com. It’s on a limited basis (minimum 50 people) but please include your desired dates as well as any other important details in your note. We do offer “Sundaes To Go” as another option .